I don’t like using perfumed products, they’re just not natural. Holos products have strong aromas, are these natural? Yes th e aromas in Holos products are natural. The aromas come from pure essential oils which are the oils that come from parts of a plant or tree. They can come from the leaves, petals, stems, fruit, peel or even the bark of a tree. The essential oils in Holos products are not merely added for aroma, they are active ingredients in the products. Essential oils have wonderful benefits for the skin and indeed for the whole well-being. What do you mean when you say the products are natural and holistic? 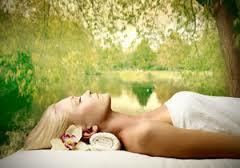 Natural means that we use pure essential oils and other natural oils and ingredients derived from natural sources. Many of our products use 100% natural ingredients and the remainder use between 99.3-99.7% natural ingredients. Holistic means that the oils are not just chosen for the benefits they have on the skin but also for the Aromatherapy benefits. For example the Lavender, Chamomile and Rose of the Good Night range are not only skin benefiting but also are popular night time oils for relaxation. For anyone looking for a Holistic approach to relaxation at night time, these products, while primarily for the skin, are a nice holistic touch to aid in that. We believe that every little bit you do helps. I have very dry dehydrated skin, what would you recommend? Our Love your Skin range has oils of Rose, Palmerosa, Benzoin and Frankincense which work very well for dry, dehydrated skin. I would recommend you cleanse with the Love your Skin Cleansing Cream and tone with our Love Your Skin alcohol free Floral Toner which is made with organic Rose water. Use the Love Your Skin Face Cream for day time use and at night time use 4-5 drops of Love Your Skin Anti-ageing facial oil before your Face cream. If your skin is very very dry, you might want to use the Good Night Rich Night Cream with oils of Lavender, Chamomile and Rose to sooth the skin. These oils are also known in Aromatherapy to lull you to sleep so a lovely night time treat. I want to try your Love Your Skin Anti-ageing Facial oil but my skin is oily so I’m afraid to use it. What do you recommend? I would recommend using the Love Your Skin Anti-ageing Facial oil. It is made with pure Moroccan Argan oil which has shown in research to have balancing effects on the sebum production in the skin. It has shown to reduce the oil level in oily skin. Use 4-5 drops at night and use the Good Morning Face Cream for day time. The oils of Geranium, Lemon and Grapefruit in the Good Morning range have a balancing effect on the skin and also encourage circulation so toxins will leave the skin more efficiently. I am menopausal and want to manage it holistically and as natural as possible. Does it matter what skincare products I use? When you manage something holistically you approach from all angles of your lifestyle. If you want to manage the menopause holistically, you look at your diet, your intake of supplements, your exercise levels, your hobbies, all aspects of your life and your use of skincare products can be a part of this. I have been a Holistic therapist for 11 years and the blend of essential oils I have always used on women going through menopause are Neroli, Ylang ylang and Jasmine. These are the oils I use in our Blossoms range. There is a Blossoms body oil which you can use after or in your bath or shower. Our Blossoms Light Exfoliating facial polish for the face is also a lovely feminine treat you could use a couple of times a week. You massage it in and let the cream sit on your face for 5 minutes letting all the oils absorb and then wash the exfoliant away. I am pregnant and have heard that some essential oils are unsafe. Do you have a safe product that I can use to help prevent stretch marks? The jury is out on essential oils during pregnancy with some Aromatherapists recommending avoidance completely and others during the first 3 months. Essential oils are extremely potent and if you do not understand the safety around them I would always ask your natural health care professional. We have decided to err on the side of caution and have developed a specific Body oil which is very safe in pregnancy. It is our Happy Momma with oils of Mandarin and Neroli. This product will help prevent stretch marks and will nourish the skin during pregnancy and breastfeeding. 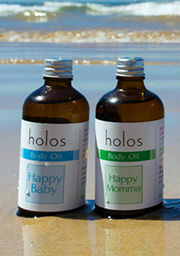 It also makes a lovely gift along with our Happy Baby body oil to new moms and babies. I have sensitive skin, can I use Holos products? Sensitivities occur in the skin for all types of reasons, intolerances to food, intolerances to products, stress, tiredness and much more. Because sensitivities vary and because Holos uses essential oils in potent levels, I would try the product first before buying. All stockists have testers of the creams and I visit all stockists every 6 weeks to provide free facials where you can come and try the products. We are getting wonderful feedback from people with sensitive skin who are getting great benefits from the rich natural ingredients in the products but I would always recommend trying first as everyone is different. 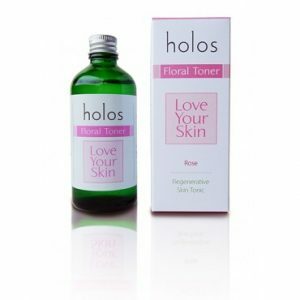 Our Love Your Skin Floral Toner is very gentle and great for calming sensitive skin and can be used as a cleanser, toner and skin softener if you want to limit your use of products because of sensitive skin. I am always tired in the morning and my skin looks dull and saggy. Does Holos have anything that will help? Our Good Morning range will give you the lift you need in the morning. Wash the face with our Aloe Vera extract face wash, splash cold water on the face and follow with Good Morning Face Cream. 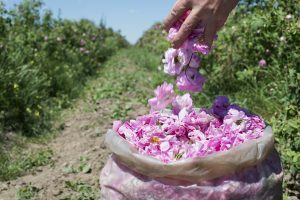 The oils of Geranium, Lemon and Grapefruit are very energising oils both for the skin and, in Aromatherapy for the entire well-being. They will lift dull skin by boosting the circulation. The aromas alone give you a lovely boost! I LOVE YOUR PRODUCTS BUT HAVE GREAT DIFFICULTY SOURCING THEM I PARTICULARLY LIKE YOU GOOD NIGHT RICH NIGHT CREAM CAN I ORDER SAME ON LINE? ?, I WOULD LIKE TO VIEW PRICES OF EACH PRODUCT BEFORE ORDERING.. Yes you can purchase online. Click on ‘Shop’ and you’ll see all the products and all prices. If you click on ‘Stockists’ you’ll find a list of stockists so you see if there is one near you. Both ‘Shop’ and ‘stockists’ are on the top of the page. You can click into them from this blog post.